The first books, other than the Bible, that I owned–the seed corn of my personal library–were the Little House books by Laura Ingalls Wilder. My dad and mom, both avid readers, gave them to me as soon as I could read. I received a beautiful hardbound copy of the next book in the series each birthday and Christmas. I read and re-read these treasures countless times. So it makes sense whenever I read a “pioneer” story to have a flash of recognition, like seeing a long-lost cousin as a grown-up instead of a child. 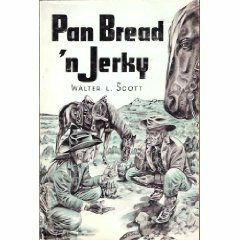 Written in 1968 by the 84-year old author, Walter L. Scott’s book Pan Bread ‘n Jerky is a rustic autobiography of a settler who saw a lot of life here in Eastern Oregon. I call it rustic because the writing is choppy and lacks cohesion. The author’s eighth grade education isn’t the problem as much as lack of editing. Rustic, because it describes a rough life. Not unhappy, but full of the vicissitudes of living in a wild country. 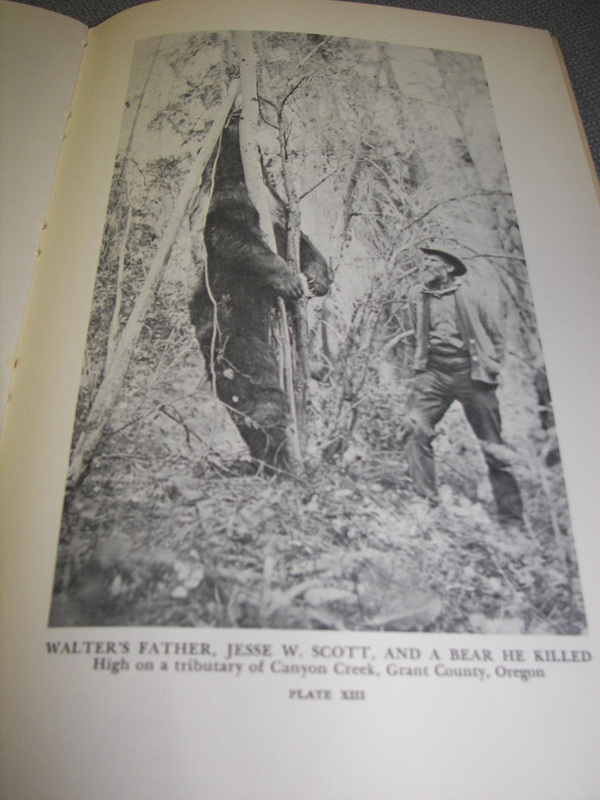 Food was hunted, trapped, gathered, and gleaned, seldom purchased. The pioneers were scrappy folk who eeked out a life any way they could from the land. Horses have played an important part in my life since I was a colt myself. Many times I’ve been on a horse when I went up but there was no horse there when I came down. I’ve been bitten, kicked, struck, stepped on, run away with, treed on a corral fence, and had horses fall on me, but I still like horses. The stories remind us that the “good old days” had their share of sorrow and tragedy. Gold mines used cyanide in the 1890’s and dumped it into the rivers. A boy lost both legs from cyanide poisoning after wading in the water. Snowslide, homicides, horse rides, suicides all snuffed out lives. But there are huckleberries, sage grouse, snowshoes, and horses which mitigate the austerity. This a bear killed by the author’s father. The bonus for me is that all the locations of this book are…local. Believe me, you East Coast and European friends, not many books are located in Eastern Oregon. (Okay, I forgot about The Shack.) Getting a glimpse of life here a hundred years ago was worth the wade through the problematic prose. So, would this book make a good gift for a 12-yr old nephew? The Little House books were the first books I had as a child too! Only mine were paperback in a slipcover. I read them until they fell apart, but I still have all the parts. I enjoy pulling one out from time to time and reading favorite sections. I think my favorite of the entire series is Farmer Boy. So much good eating in that book! @hiddenart – I don’t think so, Dana. There are better books in this line. For a 12 year old. I never before thought about there being a lack of books set in eastern Oregon… I have a friend from eastern Oregon (she always described it as drier and more desert-like than western Oregon) and we have friends living there now, but we haven;t visited them since they moved out there several years ago. Now you have me very curious about your homeland! @LauraLLD – Much drier, much less green (duh! ), and a lot of mountains. Small towns set apart from each other by 45 miles. It took time for this midwesterner (I grew up in a Chicago suburb) to see the beauty. It’s rugged country.